To be honest, I don't know much about marriage but I've heard other people say, similarly to Mignon's statement above, that to stay in love with someone you have to recall and hold on to what made you fall in love in the first place. When I was a little kid, I'd plop my notebook on my bedroom floor and write for hours. Getting lost in my imagination was the coolest thing ever, it allowed me to travel without having to leave my room! At about seven years old I learned that by creating characters, worlds, and exciting adventures... I was free to go anywhere. That's when I fell in love with writing. Years later, I'm an adult who, after working from 8-5 in a boring office and then fighting traffic to return to the place that I'm supposed to call "home," is not only super tired, but...empty. At that point, how do you, instead of diving into a bowl of nachos while watching The Real Housewives of Beverly Hills, sit at your computer and write a story? Well, there are plenty of days when the nacho thing happens...but sometimes I forgo spilling cheese on my shirt while watching grown women act like over-dressed rabid Chihuahua's and I write. The thing that motivates me to write is a recollection of my early first love of writing and the desire to revisit that feeling. So, when I sit down and start to type, after about five minutes I'm no longer "empty", I'm falling in love all over again. But enough of my yammering on about myself, what about you? Over the years, how has the relationship been? Ever taken a break, seen other people, and then gotten back together to find the passion rekindled? Thanks for visiting my neck of the internet-woods, wow that sounded weird...so how about we try that again...thanks for reading this blog post and check out other awesome Thursday's Children posts by clicking here! For me, this is where literature becomes a lifeline. Reading about interesting main characters who experience emotions similar to mine is such a relief! It reassures me that I’m not some emotionally stunted weirdo who’s alone in the world, other people struggle just as much as I do! Sure, the person who I find myself relating to is actually a fictional character, but at least I know that their emotions were inspired by a real person, a writer who I probably have a few things in common with. While reading restores my confidence in the fact that I’m human, writing is what relaxes and inspires me…it takes the sadness off of my shoulders, moving it to be borne by a character who is able to laugh at her plight, create realistic solutions, and work through the chaos of my life for me. My characters, besides opening my eyes to who I really am, kind of save my life. So, even though most of my stories spring from sadness, with main characters who have been inspired by the way I felt during some low point, writing about their adventures takes me out of myself and brings me to a happier place. Ah, writing is such great therapy! I think Jackie Kennedy was right in that we shouldn’t let sadness drown our potential for happiness. In fact, we can fight the dark side of melancholy by turning it around and using it to inspire some of our greatest work. Do you find that your work turns out better when you’re head-in-the-clouds happy or when you're listening-to-your–old-Sarah-McLaughlin-CD’s-over-and-over-again sad? Thank you to Rhiann Wynn-Nolet and Kristina Perez of Thursday's Children for letting me join in on the blogging fun! 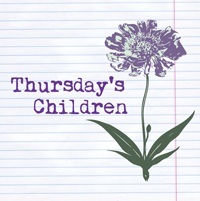 This is such a great idea and if you're a writer who'd like to be a part of Thursday's Children- click on the linky here! View other Thursday's Children Posts by clicking here or here! It seems like the happiest people are the ones who, though they might be afraid, move through life as if they aren't and take risks. Maybe that's one of the secrets to happiness, what do you think? Well, these days I'm working on finalizing the manuscript for Book #2 within the South Louisiana High Series and this one is called, Unafraid- Gina's Story. Introducing....(insert drumroll here) Gina Russo's story! Gina is one of the teachers at South Louisiana High. Unafraid hits pretty close to home in that it's about a young woman who, while she was growing up, knew exactly what she wanted in life, but somehow got lost along the way, ended up settling for the ordinary and now has to either continue suppressing her dreams or throw caution to the wind and go after her heart's desire. I loved writing Gina because she's really funny- she's an ADD movie-geek who kind of lives in a daydream (lol, yeah, I prolly should've just named her Paula) and everything she see's/experiences either reminds her of a movie or sparks some long-winded story in her imagination. So, Gina has a tendency to tune out of reality while her imagination goes off on weird tangents. I don't know if anyone else will like this character, but I definitely enjoyed writing her story. (1) Good advice can come along unexpectedly and that's why we have to pay attention to life's whispers. (2) It's never too late to pursue our dreams. I hope that when you read Unafraid (if you read it, ha!) you'll find it inspiring-or at least slightly humorous. I mean Gina's some kind of cross between Mindy Lahiri, Ally McBeal, and Emily Owens so yeah...the poor woman is crazy. But enough about Gina's insanity- what about you? Have you ever had to overcome a fear to pursue something that you really wanted? An Interview with Essine of Psychedelic Daisy! Check Out Essine's Blog, Psychedelic Daisy!